masala corn recipe - easy to prepare tasty recipe of masala corn. steam or pressure cook 1 medium to large corn cob. you can steam 1 medium to large sweet corn cob in a steamer or a pressure cooker. if pressure cooking, then pressure cook for 2 to 3 whistles in 1.5 cups water. you can also use 1 cup of tinned corn kernels. when the corn cob is still hot or warm, slice off the corn kernels from the cob. you should be able to handle the heat. if not, then wait till the corn cob becomes warm. be careful while slicing the corn kernels. you will need about 1 cup of corn kernels. take the corn kernels in a mixing bowl. add 2 to 3 teaspoons butter. the heat or warmth of the corn kernels will begin to melt the butter. instead of butter you can also use olive oil. mix the melted butter very well with the corn kernels. alternatively, you can melt the butter and add to the corn. now add all the seasonings - 1/2 teaspoon chilli powder, 1 to 2 teaspoon lemon juice, 1/2 teaspoon chaat masala, 1/4 teaspoon oregano, 2 to 3 teaspoons of chopped coriander leaves and black salt or regular salt as required. check the taste of masala corn and add more chilli powder, lemon juice, chaat masala if required. 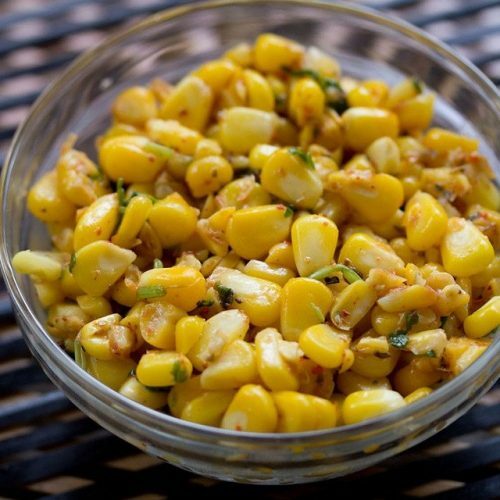 remove in a bowl and serve masala corn immediately. recipe can be increased proportionally. add spices and lemon juice as per your taste preferences. instead of butter, olive oil can be added or butter can be skipped completely.